My April vacation has come to an end and I’m back to the daily grind. I will get more into what I did in my Travel Tuesday spots but I spent about a week at the Sunshine Coast, two days on a tour of Fraser Island and 4 days on the Gold Coast. The Gold Coast was a surprise addition to my travels and I am so glad I seized the opportunity to go when it was presented. Sometimes the best things in life are the ones that aren’t planned! Anyway, with all of my traveling I haven’t had a ton of opportunities to cook. I did have a chance to help out at Easter dinner on the Gold Coast, though. I spent dinner with one of my boss’s business partners, Sharon, who opened her home to me and made me feel like family. Her family was so welcoming! 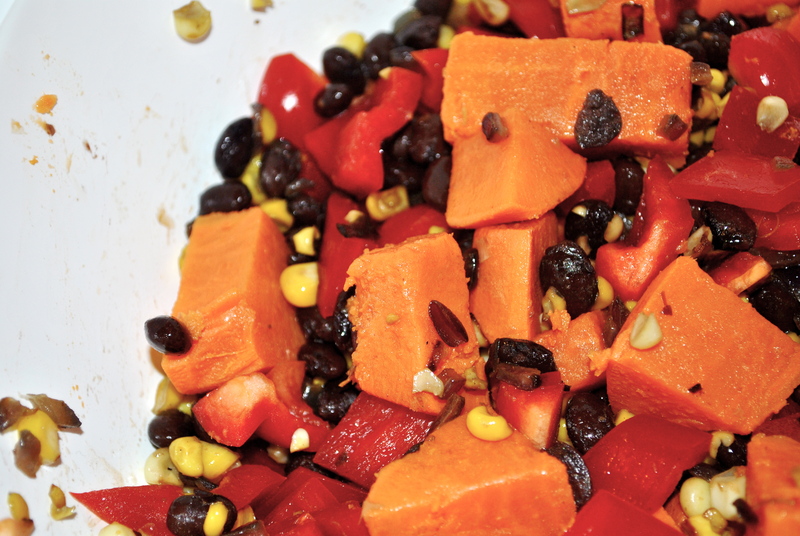 On Easter, I was put on veggie duty and helped make some homemade salsa and this super yummy salad. I was surprised how much I loved it! The ingredients are so simple but it is just so delicious. The first thing I did when I got back to Toowoomba was make a big batch for myself. Of course, my second attempt at this salad didn’t come out as good as the one I made at East. Apparently, searching Youtube for Taking Back Sunday music videos instead of stirring the pine nuts is a big no-no. So you know, I wouldn’t recommend doing that. Place pine nuts in a small skillet and heat over medium-low heat. Stir continuously until the pines nuts begin to turn golden. Remove from heat and set aside. 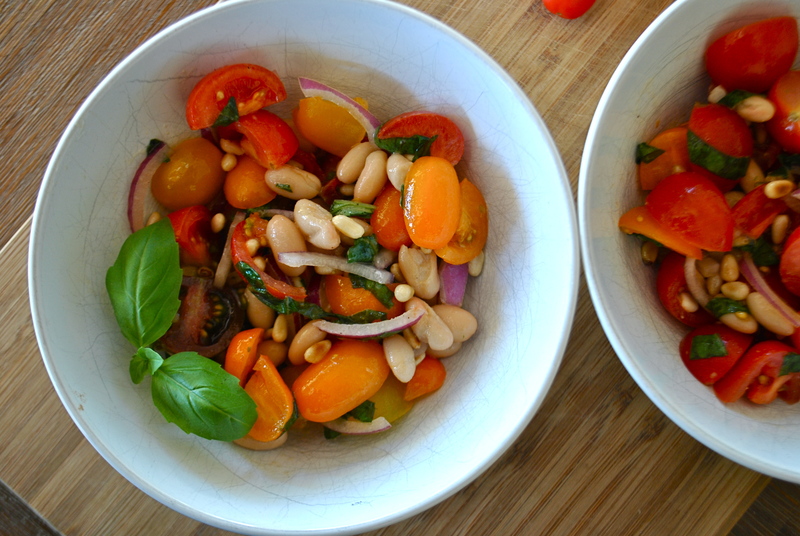 Combine tomatoes, red onion, basil beans and toasted pine nuts. 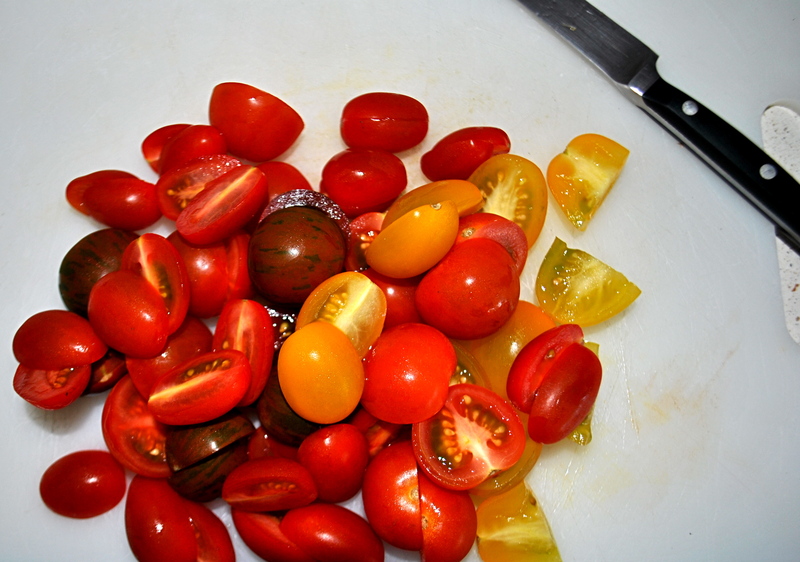 Right before serving, add olive oil, salt and pepper to the tomato mix and tossed until well combined. I opted for the mixed grape tomatoes and the yellow perino because they tend to be sweeter and because they were just so gosh darn pretty! I mean, the deep red ones are practically purple so clearly I had to purchase them. Plus, You tube distractions aside, this was such an easy dish to make. I love it because it comes together in minutes and it will last me a few days. It’s pretty and it comes together easily. What more could you ask for?? Leave it to me to wait until the last minute to give you a 4th of July recipes. So, to make it up to you, I’m giving you a recipe round up of the last years recipes that would be appropriate for todays festivities. If you want even more recipes, click on the July 4th Popsicle recipe below for last years round up. blueberry salsa The best salsa. Ever. Blueberry BBQ sauce I made this with baked tofu but it would be great with grilled tofu and veggies also. Sloppy Chicks: This was consumed at a Game of Thrones Season 1 viewing party. My friend’s boyfriend, Ben, went back for seconds and thirds and he is usually a carnivore! Side dishes: Because warm mayo potato salad is so overrated! Strawberry Macaroons You could also try these with freeze dried blueberries. Grapefruit Sorbet Skip the pies and cake drenched in vanilla ice cream and make this insanely refreshing sorbet. 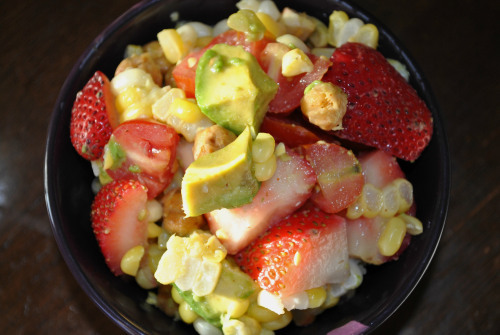 Top with fresh fruit, granola and or honey. This will be great on a hot day. 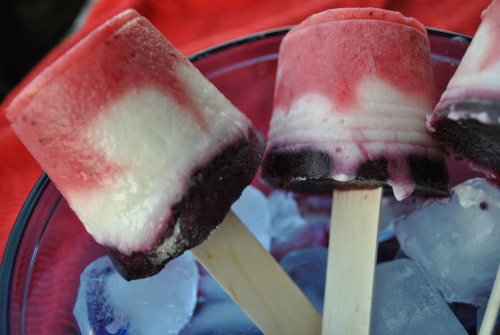 July 4th Popsicles The dessert that is currently blowing up on pinterest! There is also my 2012 recipe round-up in this link so take a look at those recipes, too! Lemon Lime Margarita There is nothing patriotic about this. It’s just delicious. Pomagranite Margarita It’s Red. It’s Tequila. What more could you want? Maybe throw some blueberries in it? Add dressing ingredients to a jar and shake vigorously until fully combined. Set aside. Add water to a large pot and bring to a boil. Add chopped potatoes to the pot of boiling water and boil for about 8-12 minutes until just tender. Do not overcook. Taste-test a few cubes for doneness. Pour potatoes into a large colander and rinse with cold water for ~1 minute to stop the cooking. While the potatoes are cooking, heat a medium pan over medium heat with 1/2 tablespoon oil. Once hot, add the onion and a large pinch of salt to the pan and cook for 3-4 minutes, stirring frequently. Add the garlic and stir for 30 seconds then add the corn and cook for about 6-8 minutes, stirring frequently, until the corn starts to slightly brown and the onion is soft. Remove from heat and pour onto a plate to cook for a few minutes. 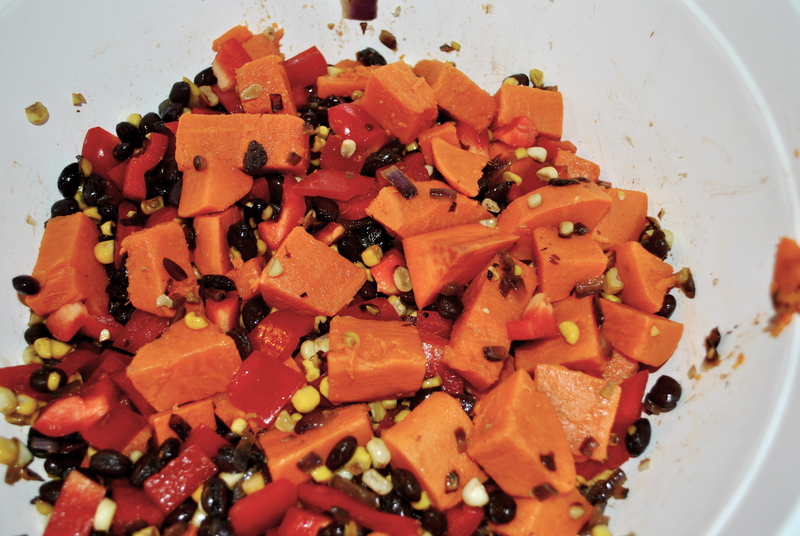 Empty the sweet potatoes, black beans, bell peppers, and corn mixture into a large bowl. Pour about 3/4 of the dressing overtop and gently toss to coat. Place in the fridge [uncovered] until fully chilled and then cover until ready to serve. Gently stir the mixture, then taste and add more dressing, salt, and pepper if needed and stir again to distribute. Place in individual bowls or in a large serving dish and top with fresh parsley, oregano, and/or cilantro. Serve with lime wedges on the side. This lasts upwards of 1 week. Even though I’ve been eating this for over a week, I have to say, it’s still pretty delicious! I love, love, LOVE the lime chipotle dressing and actually only used about half for this recipe and used the other half on a different salad I will be sharing with you later. 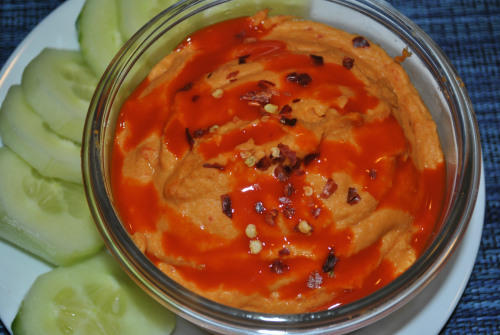 It’s super light and flavorful, perfect for summer. I think this recipe will be a great change for your picnics or cook outs and will keep things vegan without people even noticing! Ironically, I have been going non-stop all week and have plans all weekend but today is looking pretty quiet! I’m hoping to lounge around all day and do a whole lot of nothin’! Maybe I’ll go purchase some sparklers to keep in the spirit but other then that, relaxation is the word of the day. Hope everyone has a great 4th and stay safe!! This week has been rough. On Tuesday, our dog Ace, died really unexpectantly. The vet thinks it was cancer in his chest. He was still pretty young at 8 and it hit us all really hard. He was a super good dog, even though he was mildly neurotic. He didn’t like red rugs. He had a nightly routine which involved giving his blanky a tour of the house before settling down. And overall, he really didn’t like change. But, don’t we all have quirks? I can’t eat m&ms or skittles without sorting them into groups by color. Is that any less weird then avoiding red rugs? Needless to say, he fit into our family pretty well and it’s been hard losing him. So, I’ve been trying to stay busy all week. Tuesday night, despite the news, I went to ballet class, swollen red poofy eyes and all. Last night, I went on a bit of a shopping spree with my friend, Rachel. Container store, Lush, Barnes and Noble, fro-yo with soy yogurt AND Whole Foods. It was kind of epic. And perfectly fun and distracting. Thankfully and completely by coincidence, I managed to get my act together on Sunday evening and make food for the whole week. So, despite my running around and blurred vision, I have still been eating well. This salad seems like it may be boatloads of work, but you can make everything in advance and it makes several servings so you can have it for lunch or dinner throughout the week. Check out some substitutions all the way at the bottom if you want to save some time. 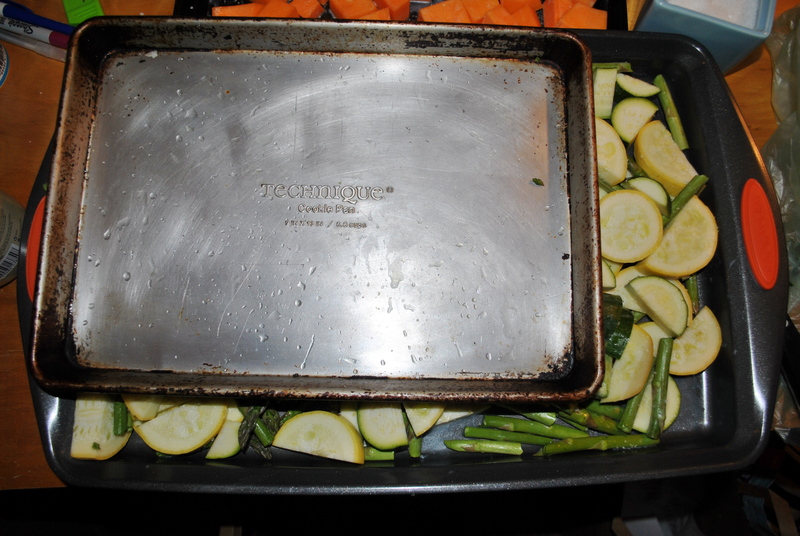 To roast the zucchini, summer squash and asparagus, I used the new baking sheet my Grandma gave me. Look how much bigger it is compared to my old ones! Dice your butternut squash into cubes and place on a baking sheet. Drizzle with coconut oil (I didnt measure but I would estimate 1 TBSP) and toss until well coated. Sprinkle with salt and pepper to taste if you are using. Dice your zucchini and summer squash. Remove the tough ends from the asparagus and cut into thirds. 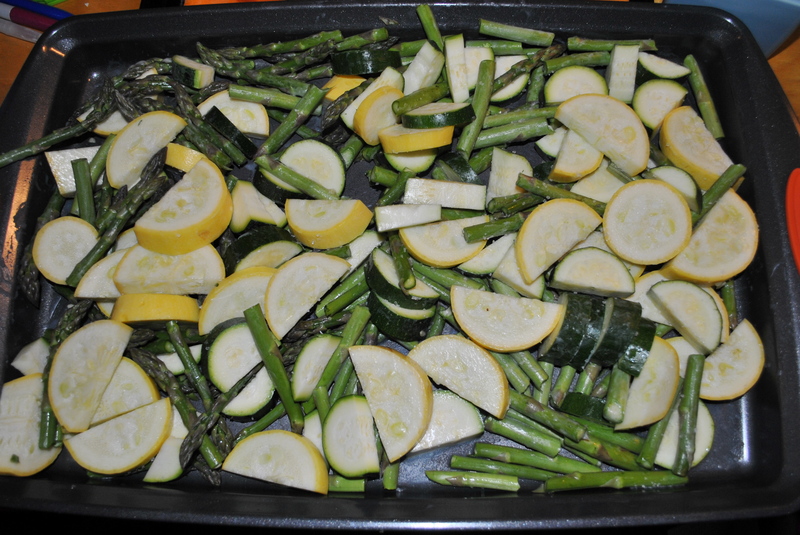 Put the zucchini, summer squash and asparagus on a large baking sheet. Drizzle with coconut oil (again, around 1TBSP) and toss until well coated. Sprinkle with salt and pepper. Place the butternut squash in the oven for 30 minutes. At the 15 minute mark, put the other tray of veggies in. When the 30 minute are up, remove the veggies from the oven. Veggies can be hot or cold when served, both are delicious so it’s a matter of preference. 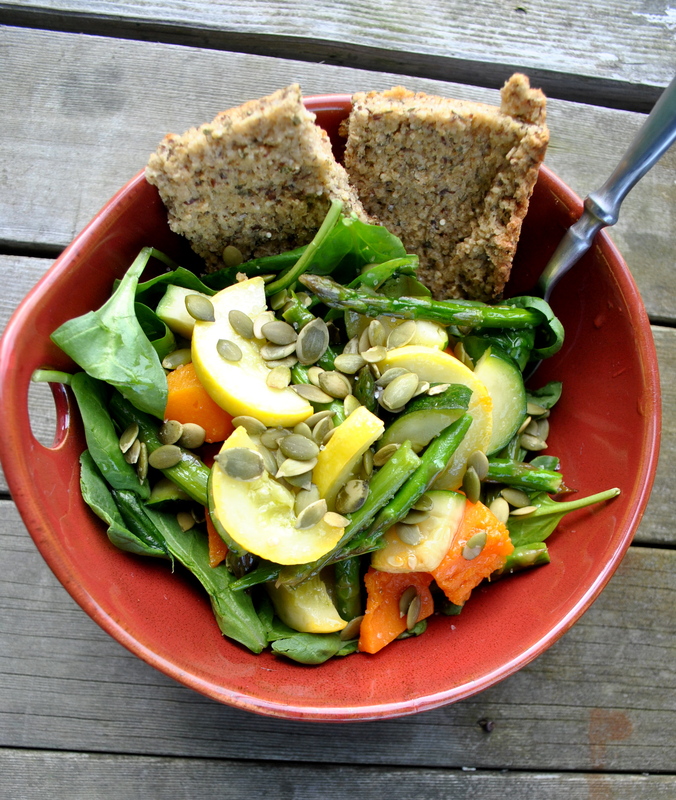 To serve, place a slice of toasted Herb Quinoa Oat Bread down (recipe below), top with a bed of spinach or arugala, then your roasted veggies, drizzle with apple cider vinaigrette (recipe below) and sprinkle with pepita seeds. Dig in!! Put in a jar, shake it up and serve. Add 1/2T coconut oil to a 9” round/square pan and place in the oven. A cast iron pan works really well. Or line a 9” round/square pan with parchment paper. Mix all dry ingredients together in a large bowl. Pour in the water, applesauce, and 1T of melted coconut oil. Stir until just combined and let sit for 5min. Batter should be thick, but pourable after sitting. While the batter is sitting, place the pan in the oven with 1/2T coconut oil for 5min. Remove from the oven and spread the oil around the sides + bottom of the pan. *If using parchment paper, skip this step. Pour the batter into the pan, spread to the edges, then shake lightly to even out. Bake for 38-42min, until the bread is cracked on top, pulled away from the sides, and edges are golden brown. I always bake mine for 40min. Let cool to fully firm up, then remove from the pan + slice. Store in a sealed container for 3-4 days. * notes from Wicked Vegan: Don’t be intimidated by the list of unusual flours. I currently have at least 5 different flours in my pantry, none of which are the ones listed above and I was determined not to buy another. So I made these flours with the oats, quinoa and almonds that I already had. Just put the oats, quinoa and almonds in a food processor or magic bullet, separately, and blend until they have broken down into a flour consistency. The oat flour and quinoa flour were very easy to turn to flour. I had a bit of trouble with the almonds, which resulted in a corn-bread texture to my bread. It was still delicious, it just didn’t look like the pictures from Edible Perspective but I was ok with that. notes from Edible Perspective: I have found coconut oil to be the best to prevent sticking. Feel free to sub another high-heat safe oil. This recipe would be great as a base for pizza. Remove the bread from the pan, pile on toppings, then bake for 5-10min. 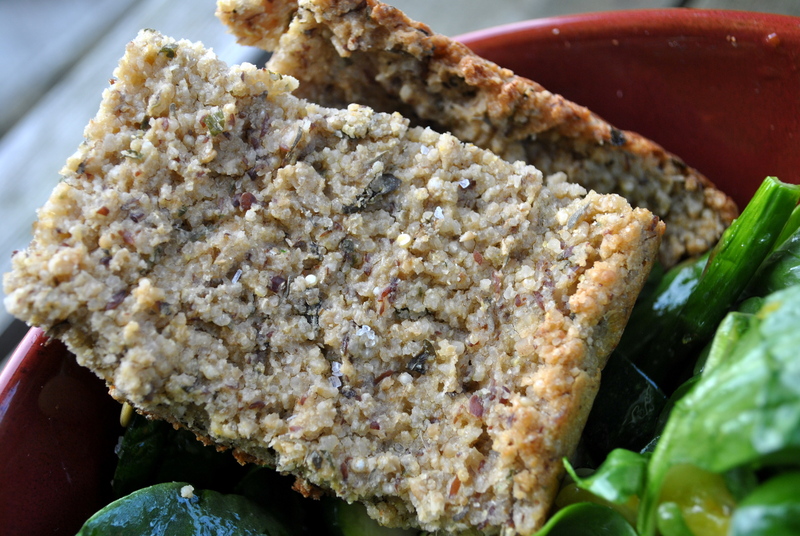 Feel free to sub buckwheat, millet, amaranth, or corn flour for the oat or quinoa flour but not the almond meal. You can easily make these gluten free flours at home in your blender or food processor. For GF oat flour, use rolled oats, oat groats, or steel cut oats. Process until turned into a fine flour. You can make almond meal by processing almonds until turned into a soft meal with no almond pieces. 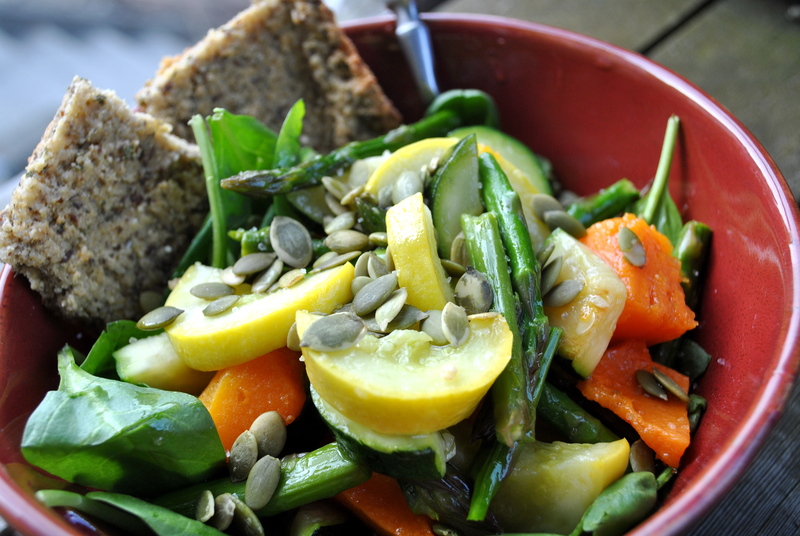 You can roast any veggies that you want for this salad. California Pizza Kitchen has a salad similar to this and they use eggplant. You could also throw in mushrooms, green beans, bell peppers or onions. I really think whatever you like would work in here. Store bought Naan can be subbed in for the quinoa bread. I had originally bought roasted garlic naan for this recipe but holy crap was that stuff delicious! I ended up eating the four pieces before I even began to make this recipe so I decided that maybe I didn’t need more of that deliciousness in the house! After all, oatmeal with a side of roasted garlic naan for breakfast, soup with roasted garlic naan for lunch and just warm roasted garlic naan dipped in hummus for dinner doesn’t exactly make a well rounded day of food. 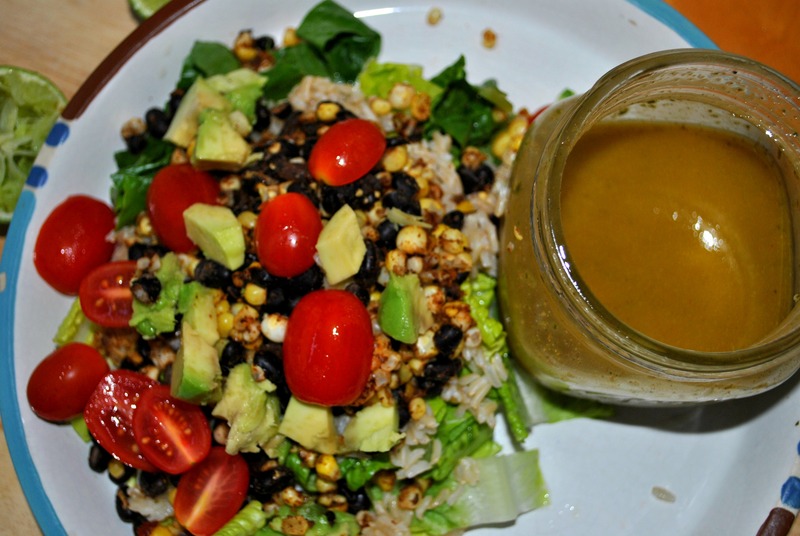 Balsamic vinaigrette, bottled or homemade, can be subbed for the apple cider vinaigrette dress. ok, I promise no more sad stuff tomorrow on WV. I’ll try and bring you some fun Friday Favorites complete with some upbeat music. So, this post is going to be short and sweet, my friends. After spending 4 straight days in bed watching Law and Order: SVU (with four straight nights of nightmares. Seriously, what is wrong with me? ), I went back to work today and decided it was time to get that New Years Resolution thing in full swing (yes, I know it’s 2 weeks into the New Years. What’s your point?). So, I ran at the gym at lunch. Then, Melinda asked me if I wanted to go do hot yoga with her tonight. I’d never done it before but I was all, sure.Why not? Oh man…I’m running on fumes right now. Fumes I tell you! I tried to shower after hot yoga (eew! So. Much. Sweat.) and I could barely muster up the energy to scrub the shampoo in my hair. I’m seriously going to have the worst hair day ever tomorrow! So here is what I am eating for lunch this week. It’s super yummy. I’m a fan of wheat berries. 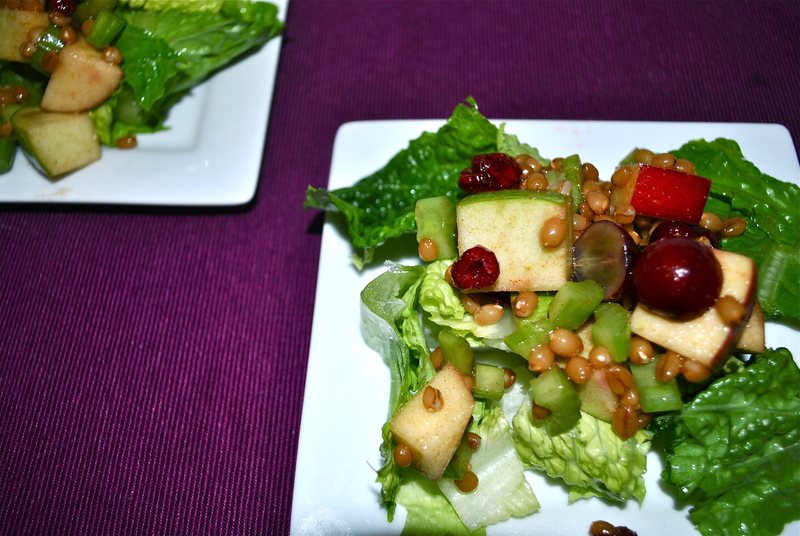 I thought Waldorf salads typically had a creamy dressing but the dressing with this recipe was actually extremely similar to the dressing that I posted with the Strawberry Chickpea Salad, except not quite as good. When I realized that, I just made the dressing from that recipe and called it a day. For dressing: In a screw-top jar, combine all the dressing ingredients. Cover and shake well to combine. 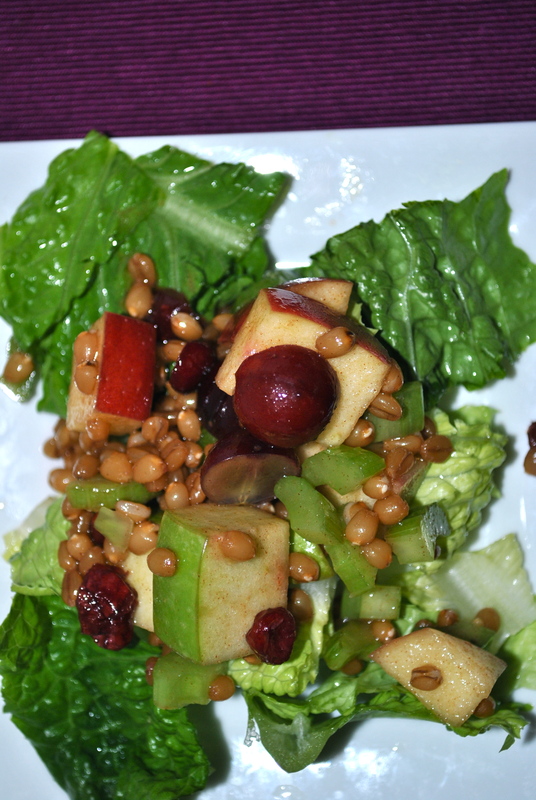 Drizzle dressing over warm wheat berries and toss until covered. You should have about half the jar left. Put aside and drizzle extra over salad when your eating it if needed. 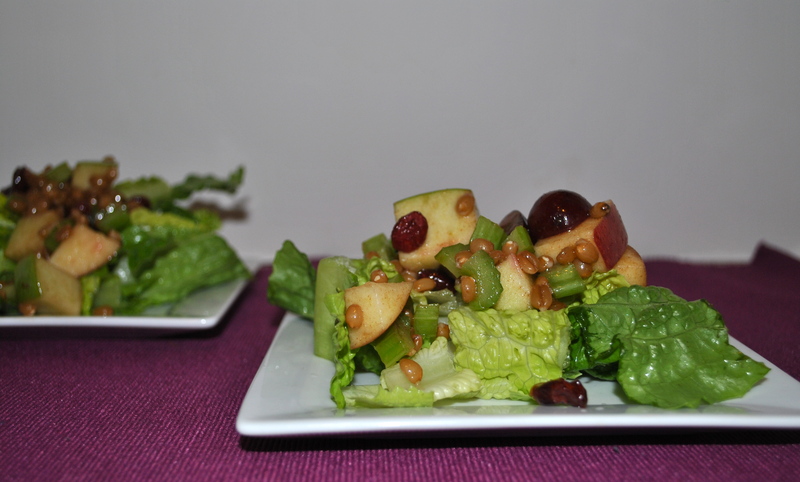 In a large bowl, combine apples, celery, cranberries and grapes. Stir in wheat berry mixture; mix well. Cover and chill in the refrigerator for up to 4 hours if not serving immediately. To serve, arrange lettuce cups on a large platter or divide them among individual salad plates. Spoon salad into the lettuce. Sprinkle with nuts. Makes 6 to 8 side salads. For lunches, I chopped 2 cups of lettuce up and placed it in a separate container. In the morning, I added about 1/2 – 2/3 cup of the wheat berry mixture to the lettuce and just took it to work like that. It made about 4 lunch servings. Happy 2013, everyone! I hope you had a great holiday season. I know I promised you cookies and such during December but I sort of fell off the radar. I spent most of December crafting my brains out. I think I mentioned that I decided to make most of my Christmas gifts this year? yeah…I bit off a little more then I could chew and I’m still working on Christmas gifts! I’m in the home stretch though and I’m excited to get back to normal. The month of December was by far the worst month I’ve had since going vegan over a year ago. I fell off the wagon…a lot. I like, fell off the wagon and then clung on by my finger tips as the wagon sped off going full speed and I was dragged along. You totally get me, right? Right. Anyway, I’m pretty sure this was 100% due to the fact I rarely cooked. I did a lot of delievery and take-out food. Pair that will the almost endless supply of cookies I had and my nightly drink of Lake Champlain Mountain Mint Hot chocolate (this is delicious!) with mint chocolate baileys aaaand eating healthy was quickly thrown out the window. But that’s life and no one is perfect and it’s the beginning of a new year! So let’s kick it off with some super yummy food. Let’s start things off on a good note, eh? Save the chocolate stuff for later in the week? Pretend for 4 whole days that we have made some sort of resolution about eating healthy and that we’re sticking to it? Cool? Cool. 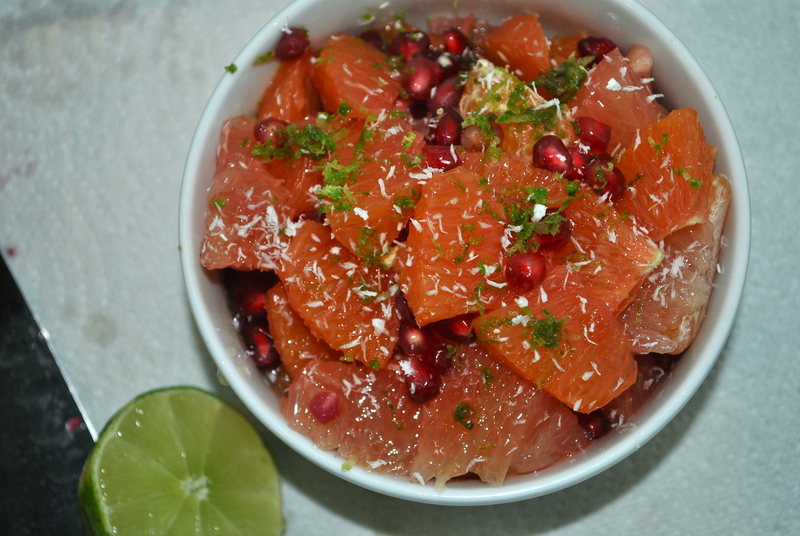 This citrus salad came about for two reasons: 1. I, like every single person in Boston, have been sick on and off with a cold. Nothing serious. Nothing that gets me out of work. Just kinda blah. Stuffy nose, sore throat, sporadic coughing and sneezing fits and just an overall sense of feeling under the weather. (My friend, Melissa,who is one of those weird people that knows grammar rules, probably just fell into an uncontrollable amount of twitching with all those incomplete sentences! ha!) I wanted something that packed some nutritional punch. Hence, the vitamin C mother-load. And 2. I’ve been eating so much sugar lately that I was actually craving something healthy and light for breakfast. 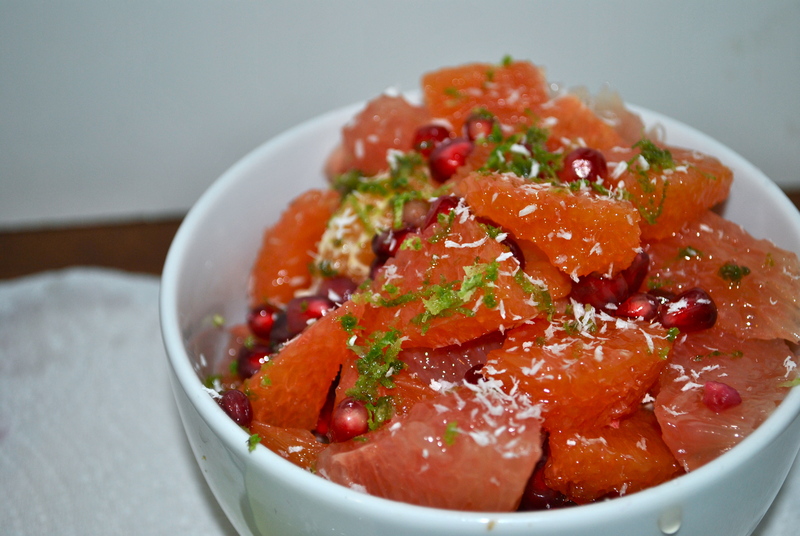 Toss the grapefruit, orange, clementines and pom seeds together. 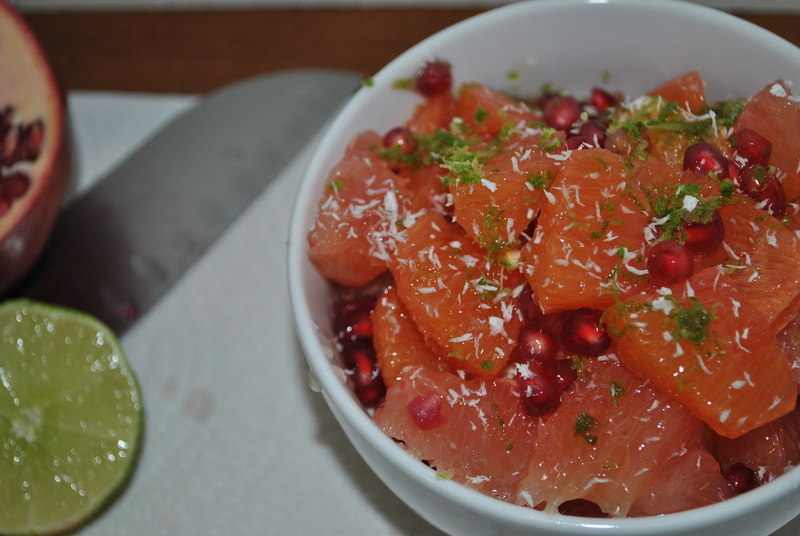 Top with honey/agave nectar, lime zest, lime juice and coconut and toss. Eat and feel awesome! You could also top with toasted coconut or a cinnamon-y granola. I did both and they were delicious. Edible perspective put a scoop of this on yogurt and topped with pistachios which seems super interesting and I may have to try next! This makes approximately 3 cups of salad. I found most mornings I could eat this over the period of an hour or so. It may be too much to just sit down and eat, though. I have to say, this definitely has hit the spot this winter. I have been all about the comfort food so it’s nice to start my morning with something bright and refreshing. So yummy! PS. I totally bought the Whole Living magazine this recipe is featured in for the vegan chocolate truffles on the cover, not the citrus salad. oh yeah! Hopefully, I’ll be making those soon. Oh, December. The month where it’s sort of ok to start your morning off with peppermint hot chocolate, have three desserts during the day, go to a Christmas party for dinner and then come home and have a candy cane as your watching TV at night. It’s a little insane. I mean, I love it, but it’s a little insane. So, to help balance out the complete excess of sugar, I tried to prep something health for dinner this week. I mean, I still wanted it to be sorta festive because, hello, it’s December. I would be the uncool blog on the block if I didn’t provide you with something festive each and every post, but seriously. There is more to life then cookies. So here is a kale salad. It has green stuff and it has red stuff so you know, when you combine it, it’s festive. This totally counts as a holiday post now, right? I have holiday colors… How about you turn on some holiday tunes while your reading the rest to make up for the fact that there is no sugar in this. Preheat oven to 350 degrees F. Place kale in a large bowl and massage oil, apple cider, nutmeg, pepper and 1/8 teaspoon salt for 1-2 minutes. Spread on a baking sheet in a single layer and roast for 10 minutes. Toss well and roast for 5-10 minutes more, until slightly crispy but not golden. While kale is roasting, heat a skillet over medium heat and add sausage. Cook until heated through and turning golden. Set aside. Add the shallot, garlic, sweet potatoes and apples to the skillet, tossing with remaining salt and cinnamon. You want the sweet potato and apple finely diced, only slightly larger than the pom arils. Cook for 5-6 minutes, stirring occasionally, until soft. In a small saucepan, add pecans and toast over low heat for 5-6 minutes, until golden and fragrant. Set aside. Combine kale with apples and sweet potatoes, pecans, sausage and pom arils. Jessica at How Sweet Eats was correct when she said you don’t need dressing for this salad. The sauteed sweet potato and apple, combined with the oil/vinegar mix on the kale makes it plenty flavorful. Now that I have given you a healthy recipe, I feel less guilty about planning on giving you a cookie recipe for tomorrow. It will be chocolate-y and peppermint-y and booze-y and you will love it. I promise. I will then most likely follow that up with about 800 other chocolate peppermint recipes because, seriously, I’m obsessed with that flavor combo this season. More on that tomorrow, though. I wish I could say I was looking forward to this weekend but I am working Saturday and Sunday so I’m not going to get too much of a break! I will be getting to try a new vegan restaurant with my book club, though, which I’m super excited for. Our book this month was Name of the Wind by Patrick Rothfuss. It is a really well-written fantasy novel. But not like campy fantasy with dragons. Not that I don’t love a campy fantasy novel every now and than! This just isn’t one of them. Anyway, now that I have given hands down one of the most vague reviews ever, go check it out. I’ve been meaning to post this video forever because I cannot get enough of this song but it just hasn’t happened. So here! Check them out! 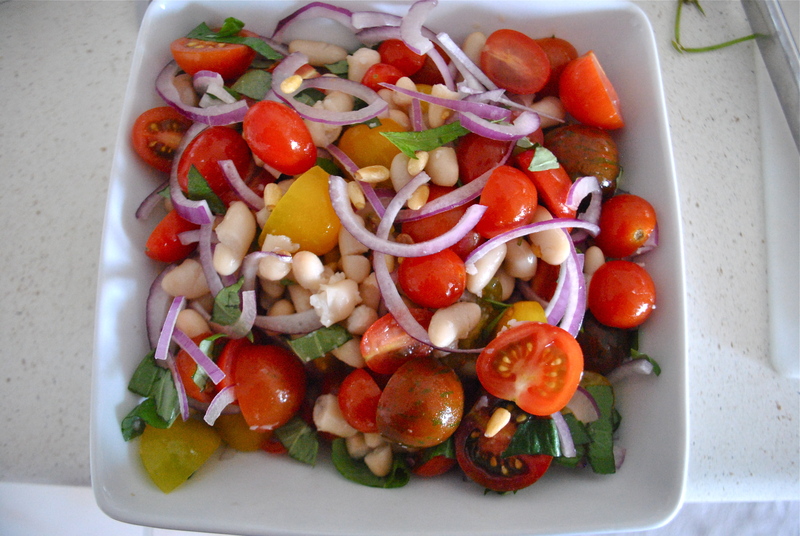 And last but not least, you should not only check out this salad, you should definitely make it! The ingredients and steps sound complicated but you can take short-cuts. For instance, instead of dried beans you could used canned and in place of corn on the cob, you could used canned or frozen. 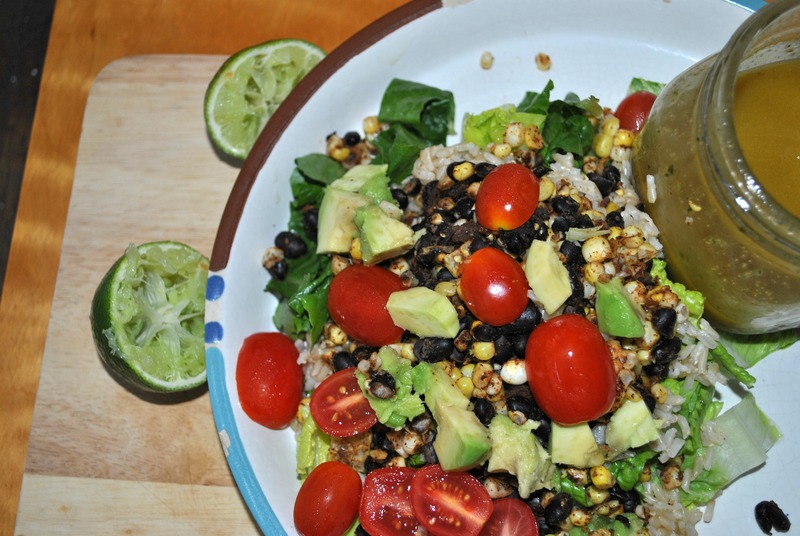 Or, you can make all the components (rice, black beans, and corn-on-the-cob) a head of time so that when you are ready to make the salad, everything comes together quickly. If you are using dried black beans, cover the beans with hot water, put a cover on the pot and bring to boil. Let boil for 3 minutes. Remove from heat and let sit for 1 hour. Do not remove the cover. Once you have let the beans ‘fast soak’, drain and refill with water and let the beans simmer for about 1 hour and 45 minutes. Drain remaining liquid and set beans aside. While the beans are cooking, start the basmati rice. Follow the packages instructions. 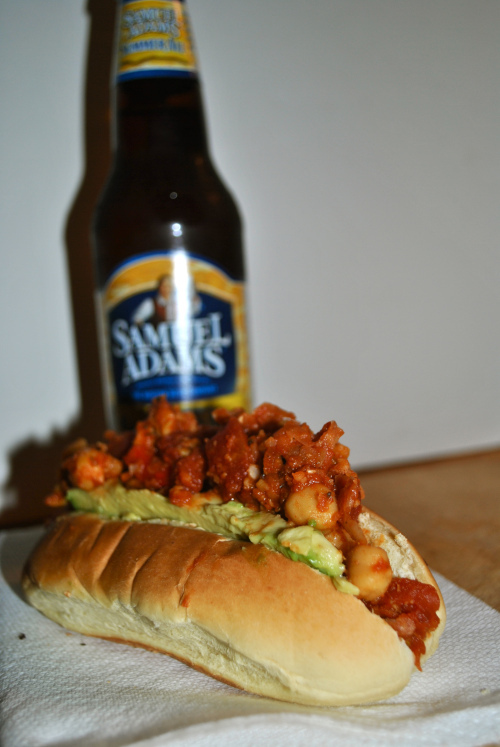 While the rice and beans are cooking, start the corn on the cob. Bring a large pot of water to boil. Place the corn on the cob in the water and boil for about 8 minutes. Let cool. Once your corn is cool, remove the corn from the cob. 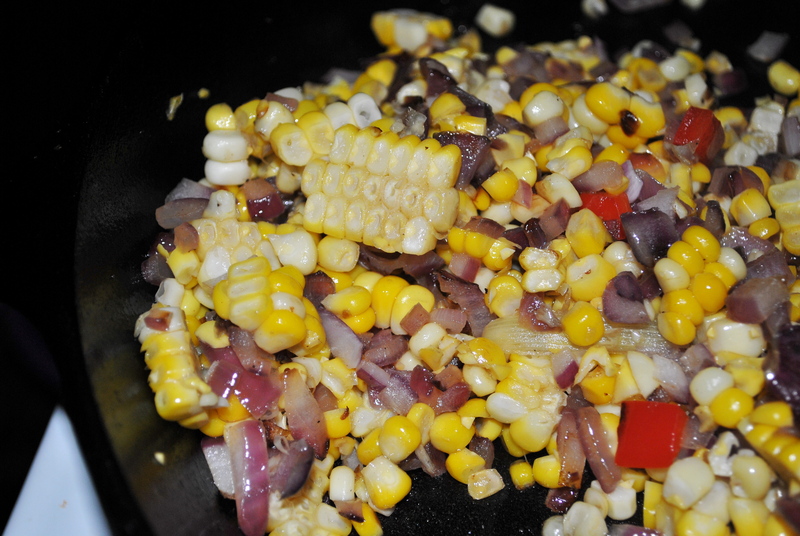 Place your corn and 2 cups of beans in a hot skillet with your cumin and chili powder. Cook until warm and well mixed. 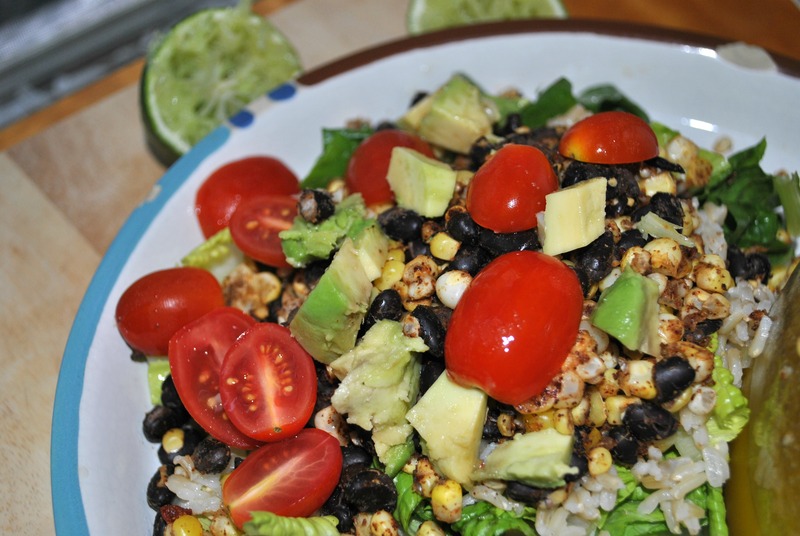 To assemble your salad, combine lettuce, rice, beans and corn mixture, tomatoes and avocado and drizzle with dressing. If you are bringing this for lunch or on the go, chop up 1 cup of lettuce, 1/2 c. tomatoes and 1/4 avocado in one container. Place 1/2 cup of rice and 1 cup of the bean/corn mixture into a smaller, separate container so you can warm it before eating. Whisk all the ingredients together. Can be used right away but tastes best when allowed to sit over night. Like I said, it’s a bit of a process. I made the rice, beans, corn and dressing on Sunday afternoon. 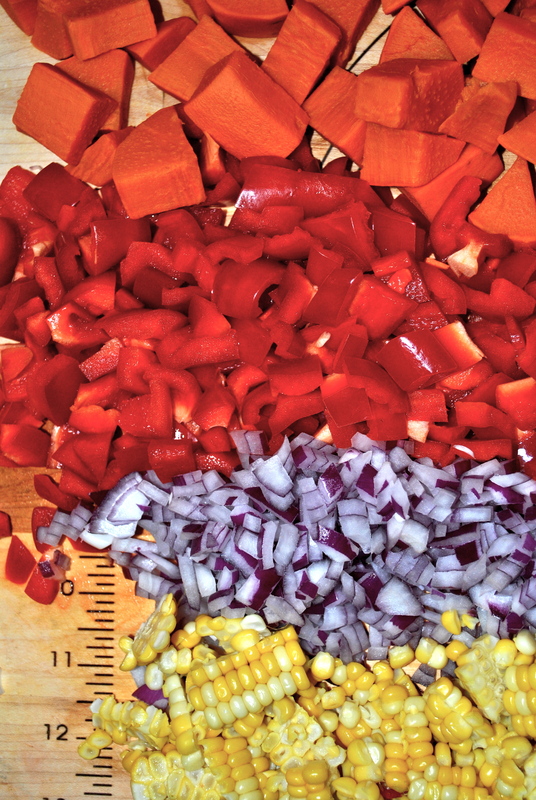 Then, the night before work, I place all my veggies together and all my warm ingredients together. It comes together pretty quickly! 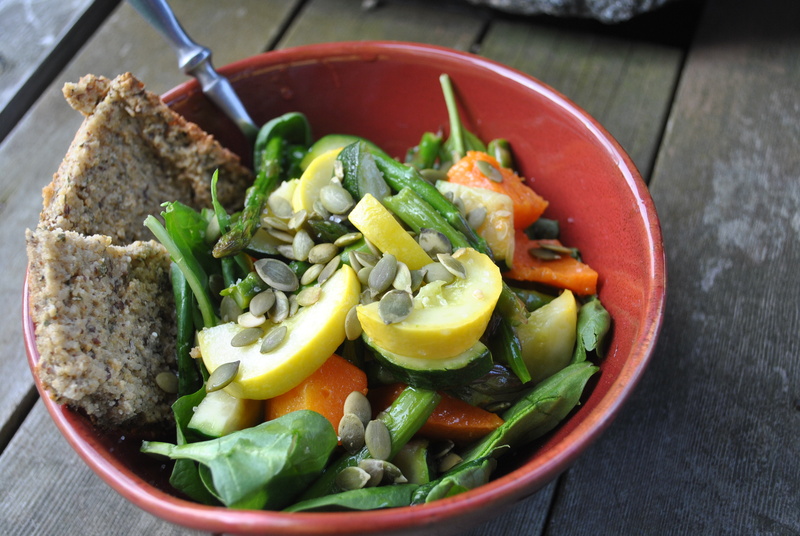 It’s a super yummy and filling salad so definitely give it a try! I also made this by ditching the dressing, mixing the rice and beans with chipotle salsa (found in the mexican food section of your grocery store, next to the chipotle in adobo sauce) instead of the cumin and chili powder, and using the juice of half a lime for my dressing and it was delicious! Since you already have a healthy fat on the salad (avocado), it gets rid of all the olive oil in the dressing but keeps the chipotle lime flavor. Either way, this salad is delicious! ok, everyone, I hope you have a great weekend!